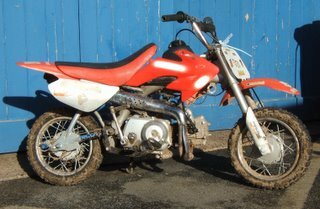 Police officers are trying to find the rightful owner of a red mini motorbike that was seized yesterday morning and is believed to be stolen. Officers stopped the bike as it was being ridden around the Cliffs End area of Ramsgate. Two 16-year-old Sandwich boys were arrested on suspicion of stealing the motorbike. Both have been bailed until 22 March pending further enquiries. Officers have released a picture of the bike in an effort to identify its rightful owner. Anyone who thinks the motorbike may be theirs is asked to contact PC Nick Ward at Margate Police Station on (01843) 222 065. I saw some youngsters playing around on one of these on the front at Westbrook. Great fun in the right place but are they now becoming the next nuisance we will all have to put up with?